Darcy James Argue's Secret Society: A Jazz Big Band Worth Blogging About Darcy James Argue leads the 18-piece jazz ensemble Secret Society, which he describes as "steampunk." He also writes one of the jazz world's most popular blogs. And, thanks to his fans and readers, Argue was able to make his first album. Infernal Machines is also available as a digital download via Amazon MP3, iTunes and eMusic. Thing is, I'm a white guy from the West Coast in my early 30s. If I have a culture, it's like grungy guitars and kind of minor-key chord progressions. I never really considered making music that didn't involve that in some way. 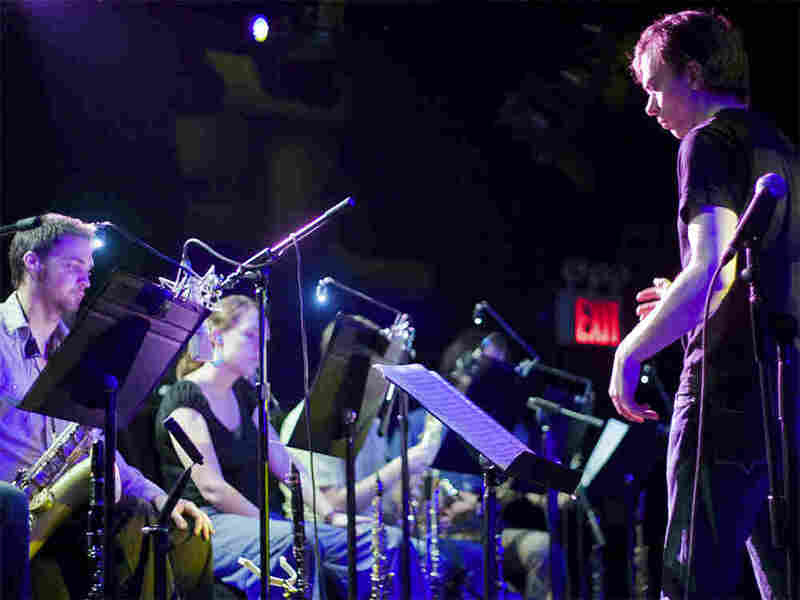 Native Canadian Darcy James Argue has been leading Secret Society, his New York-based large ensemble, for over four years. Darcy James Argue didn't move to New York to start a blog. He just needed a Web site for his new band. "We're kind of a two-blogging apartment here," Argue says. "My girlfriend has a political blog that she had started, and I started to get jealous. ... And hers is much more popular than mine." Argue writes frequently about jazz and modern music, with forays into politics and pop culture. His secretsociety.typepad.com has become one of the most popular jazz blogs. But his site also functions as an information hub for his band, Secret Society. He's posted downloadable recordings of nearly every gig that Secret Society has ever played -- more than 30 sets in all. Peter Hum is an arts editor for the Ottawa Citizen, where he, too, curates a blog about jazz. Hum says he's impressed with the way Argue has put his music out there. "Isn't that the drug-dealer model, where you give away a bit of your product for free, and then the people get hooked, and they want more, and they're willing to pay for it?" Hum says. Even before he listened to the music, Hum says he first got into Darcy James Argue as a writer. "His Web site just struck me as a really cool place to go and learn about jazz through the eyes and ears of someone who's really out there doing it in New York," Hum says. Nearly four years after his band's first gig -- in the basement of the former New York rock club CBGB -- Argue has finally released Infernal Machines, Secret Society's first studio recording. Argue, 34, says he waited so long to make an album because he wanted to perfect the details. It's not cheap to record an 18-piece big band -- or, really, to do anything with an ensemble that size. So Argue turned to his listeners (and readers) for help. He set up a fund where fans could make tax-deductible contributions, and asked his blog's readers to contribute. "That's, like, my least favorite thing to do on the blog," Argue says. "NPR, I'm sure you can relate; no one's going to like doing the pledge drives." He says he was overwhelmed by the response, even though it only came out to a little more than 10 percent of the recording budget. He is funding the remainder through his day job, as a music copyist. The work of a music copyist can seem, well, a bit random. One recent client was Calvin Klein's CK One fragrance. "They wanted the jingle that they use in their ads -- they wanted a transcription of that into music notation," Argue says. "You know, any time I get a chance to do one of those, I will, because it means I can then afford to do more Secret Society work." Secret Society isn't just any jazz big band. The music is informed by the science-fiction subgenre called Steampunk, which envisions a future where steam power is still the day's dominant technology. "For me, the core of it -- like, the essence of what was in steampunk was this kind of creative referencing of the past," Argue says. "We've got this antiquated music technology, the big band. And this used to be a very standard instrumentation back in the '30s and the early '40s before WWII. Like, pretty much everything you'd hear on the radio involved a big band." Argue says that the big band was something of a technological necessity in the 1930s. Back then, there was no amplification, so if you wanted to throw a party, you needed a lot of horns to fill a room with music. But Argue is asking: What if big bands were still widely popular in 2009? What if jazz bandleaders and indie rockers shared the same stages? "As technology kind of improved, big bands kind of fell out of favor, except with diehard nutjobs like myself who really loved the possibilities of having those many instruments together in a room," he says. "And then I'm kind of taking it and saying, 'Well, what would it be like to play this modern, studio-crafted rock with this swing-era technology?' "
Ingrid Jensen has played trumpet and flugelhorn in Secret Society since the band's first gigs. "It goes from anywhere from ethereal and spacey to very, very deep grunge-rock-techno, et cetera," Jensen says. "Feels like the feeling I had when I used to play in these old swing bands where they really swung. But in this case, it's more like really rocking out." Darcy James Argue isn't afraid to embrace the pop and rock of today along with the music of great big-band composers. After all, he says, it's the music of his generation. "Thing is, I'm a white guy from the West Coast in my early 30s," Argue says. "If I have a culture, it's like grungy guitars and kind of minor-key chord progressions. I never really considered making music that didn't involve that in some way." Argue has seen his band's performance schedule pick up slightly since the release of his new album this spring. He hasn't been blogging quite as much lately, either -- he's says he's been busy copying music to help pay off his "big-band habit."